ObamaCare’s Healthcare Exchange begins January 1, 2014. 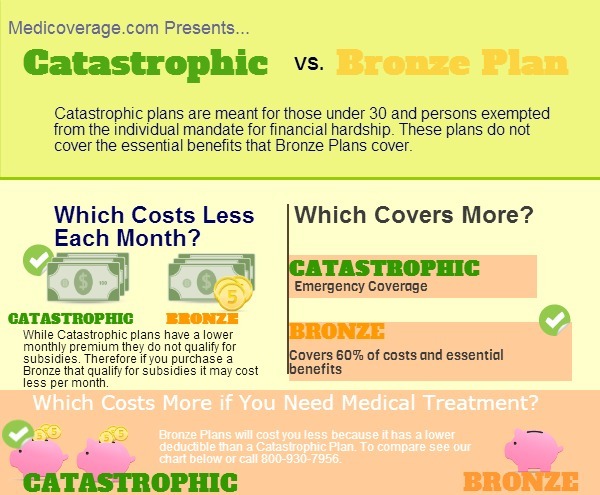 Young people are wondering which is the better plan for them: the Catastrophic Plan or the Bronze Plan. We’ve broken down the two plans to help you make a decision when the Healthcare Exchange’s open enrollment ranges from October 1, 2013 to March 31, 2014. Below is the most accurate information available. Since individual states and insurance providers are still trying to understand this brand new law, the information below is subject to change and we will be updating as details becomes official. The comparison of the Bronze Plan is for families and individuals and the Catastrophic Plan is for individuals only. click here to learn more about ObamaCare for Small Business Owners. This information does not include the two types of federal subsidies: premiums and cost-sharing, click here if you want to learn Are You Qualified for ObamaCare Premium Subsidies? or if interested to learn, Are You Qualified for Healthcare Exchange Cost-Sharing Subsidies? *Must meet your out-of-pocket max before essential health benefits kick in. For information about specific details of health plans in your state call 800-930-7956. Based on your medical history which plan offers you the best coverage. Bronze is the better choice than Catastrophic, and may be less expensive, because of its lower deductible, more benefits before hitting the deductible, and the federal premium subsidies help to lower monthly costs. However, if you are ineligible for subsidies because of a hardship exemption a Catastrophic Plan is better than being without coverage. Also, if you are a healthy twenty something it gives you peace of mind. Click here to compare the Bronze Plan, Silver Plan, Gold Plan, and Platinum Plan side-by-side. We can help you determine if you have an exemption, a subsidy, and how much your individual monthly premium would be. Click here to contact a Medicoverage agent to get started. Multiple sources indicate the catastrophic plan covers essential health benefits after the deductible and the out of pocket max has been hit. This needs to be clarified to your readers. Good catch! It helps us to have conscientious readers like you to help us. We have changed all the articles to reflect this information.